Welcome to HEXOcell - we are a growing family of professionals dedicated to perfection in our respective fields. We are here to fill the developmental void in e-liquids because the vaping industry has been focusing unbalanced amounts of resources on improving hardware while e-liquids have been considerably neglected in this regard. Our goal is to offer optimal utility and value to our clients by continuously improving our technology base, technical skills, and organizational structure. HEXOcell - the IQ in liquids. Our extensive selection of liquids are guaranteed to please even the most discerning vapor gourmet. Please click below to view the full line of our savory blends just dripping with flavor. The best results require the best tools – at HEXOcell, we understand the significance of cutting-edge technology. This is why every piece of hardware and software is continually updated to reflect the newest developments that alter the processes by which e-liquids are made. HEXOcell operates an optimized production line that ensures the lowest costs and wastage - real savings which we pass on to our customers. Our razor sharp modern machinery includes a fully automated filling line that contributes to the famous benchmark quality of HEXOcell e-liquids. Automated processes guarantee defect-free batches with each production run. Computerized production also creates an extremely high level of consistency through rigid replication so every batch is guaranteed to adhere to uncompromising quality standards. Naturally balanced innovation holds the key to success. Sometimes e-liquids take on a life of their own during the production phase where even a slight tweak creates an utterly different taste. Other times e-liquids can have the simplest of structures with only a few components. At HEXOcell we always focus on you, and try to understand your needs. The way this method helps us make better e-liquids is best illustrated using the atomizer example. There are countless different types of atomizers that are manufactured by different companies. It is a known fact that flavor transmission is not standard in every atomizer. As a matter of fact, flavor transmission varies radically with every different atomizer make and model. 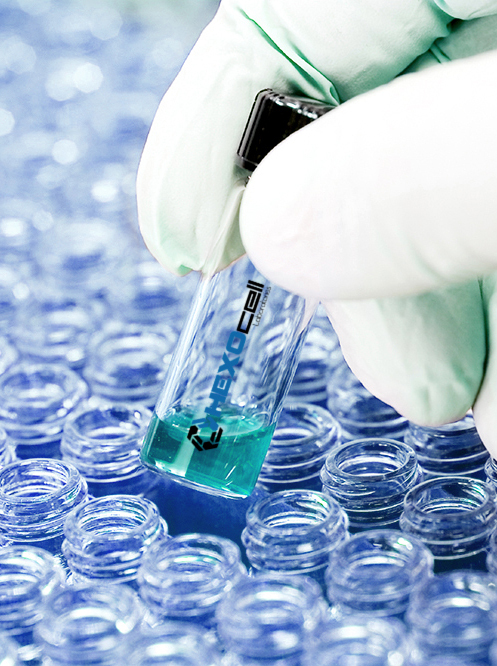 HEXOcell QC tests every e-liquid using an extensive sampling of atomizers to ensure each e-liquid performs at optimal levels regardless of hardware. We match our in-house diligence by researching the vaping industry periodically, including colleges, institutes, and various other organizations where knowledge is created. Producing e-liquid is a delicate process that requires minutely specific touches to achieve desired results. This is chiefly because the marketplace demands flavors that need specialized chemical engineering. An e-liquid and the flavoring in it must be able to withstand QC testing and be able to compete in the open market with a competitive price. It should transmit flavors correctly and taste great. To achieve such results, we make use of the best technology available but the most important asset we have is, and always has been, our customers. Without your feedback and guidance, we would not have been able to achieve what we have. We are looking to appoint principal distributors in new territories that are willing and able to sell HEXOcell e-liquids in new markets to build on the success we have been enjoying with our existing distributor pool. We work closely with you and deliver solutions most suitable for your market. We take utmost care of our distributors and aim for long-term partnerships because we understand your success to be our own. If you are interested in becoming a distributor in your area, please click here to contact us.